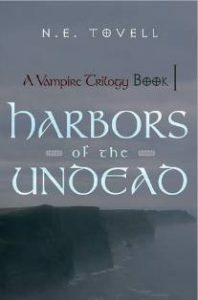 A Vampire Trilogy: Harbors of the Undead: Book I (Retail $10 e-book; $20 hard cover), is the first book in a series of three, written by N. E. Tovell. Although this is her first book in this genre, her experience as a college professor of English is evident. This is not one of those fluffy novels, riddled with space-filling superfluous words. Tovell writes eloquently. Every word has a specific purpose, creating story-telling sentences that paint rich scenes on the canvas of your mind. In just a few moments of reading, you realize that the book has turned into a movie which quickly begins to play in your soul, where you feel connected to characters who seem like long lost friends. Once you allow this movie to begin, you will find yourself mesmerized by the colorful characters and the evolving plot. Not since I read Dan Brown’s The Da Vinci Code, have I been so absorbed in a book so quickly. The story is centered around Delbeth Sitric, a teenager who loves life and wants to attend her high school prom, while at the same time her life is threatened by those who wish to make her extinct. Delbeth is an immortal human/faerie/vampire blend who is a perceived threat to the Croatian Tribunal that has condemned her to extinction. Protected by her rather overbearing vampire father, and tempered by her sometimes over caring faerie/human mother, she is like many teenagers. Her home life, though, can be complicated at times with the special “gifts” within her family, like incredible hearing, and knowing each other’s thoughts and feelings. While these gifts can help keep her alive, they can really challenge a teenager’s desire for privacy. Delbeth is definitely caught between two worlds. Having grown up in the United States, Delbeth must flee with her family to Ireland to seek safety in the Celtic world from the political forces that would exterminate vampire blends like her. Like most teenage girls, she wants to find that special man and become the woman she has always dreamed of being. Fate, though, has her become part of the Celtic mythology when she weds her protector and shares his destiny. Whenever we review products at Computer Times, we search the Internet for other reviews, looking for features we may have missed. In searching for reviews of this first book of the trilogy, we consistently found positive comments: one comparing Tovell’s refreshing point of view to that of Holden Caulfield, who wrote The Catcher in the Rye; another encouraging Tovell to hurry with the next book (which has been published as A Vampire Trilogy: Tides of the Undead: Book II); others calling Tovell’s first book the best they have read in a long time; and a comment that the reader felt like she was in Ireland with the family. In an interview with Tovell, she noted that the locations in her book are actual locations which people can visit. She does extensive travel and on-location research, which bring a realistic richness to her stories. She is a lovely lady with a passion for writing, who began writing stories for her granddaughter. A native of Chicago, Illinois, she is a graduate of Southern Illinois University, a former Evansville, Indiana school teacher, and is now an Assistant Professor of English at Sullivan University, in Louisville, Kentucky.